Coagulants and flocculant’s are formulated to assist in the solids/liquid separation of suspended particles in solution. Such particles are characteristically very small and the suspended stability of such particles (colloidal complex) is due to both their small size and to the electrical charge between particles. Conditioning a solution to promote the removal of suspended particles requires chemical coagulation and/or flocculation. CIFCB Liquid coagulant with a cationic charge. This product is excellent for breaking emulsions formed with oils, inks, surfactants, etc. It is easy to feed, economical to use, effective at low dosages, and performs well over a wide pH range. It also precipitates phosphates from wastewater streams. CIFSB A Ferric sulfate based liquid coagulant with a cationic charge. It is a blended coagulant formulated with an inorganic polymer and cationic polymer. CFS-125 A polymerized ferric sulfate blend formulated for use as a coagulant. Can be used as a successful replacement of Polyaluminum Chloride and even Aluminum Chlorohydrate. It is a stable, acid deficient solution which allows it to be used successfully in alkali deficient waters. Also results in less pH depression, translating to savings in overall chemical usage. HBC-7507 An inexpensive inorganic aluminum polymer blend formulated for use as a coagulant. HBC-7507 has been very successful in the replacement of alum, ferric chloride, ferric sulfate and other inorganic salts, as well as organic polymers. The floc formed by HBC-7507 is characterized as being larger particles with higher surface area, and very sheer resistant in some cases. This formula is less acidic than other similar products and reduces the need for alkali to raise pH after using. This results in a reduction of overall treatment costs by lowering or eliminating the need for alkali and reducing sludge generation. CIACH An inorganic aluminum salt formulated for use as a coagulant. CIACH has also been very successful in the replacement of alum, ferric chloride, ferric sulfate, and organic polymers. Using CIACH results in a reduction of overall treatment costs by lowering or eliminating the need for alkali and flocculent aids, reducing residual sludge generation, handling and disposal costs, extending filter runs and water production and reducing chemical handling and storage requirements. CIOB-5 A blended coagulant (Aluminum Chlorohydrate) formulated with an inorganic polymer and organic cationic polymer (Amine). Incorporates the benefits of using ACH and PAC, and reduces polymer feed requirements. CIASB A liquid inorganic blended coagulant with a cationic charge. It is formulated with an inorganic polymer and cationic polymer (Amine). FL-neg A class of anionic solid and liquid organic acrylamide copolymers with a high, medium and low charges and weights. Used as all-purpose flocculants particularly effective on inorganic streams. FL-pos A class of cationic solid and liquid acrylamides with high, medium and low charges and weights. Used as flocculants in various applications and particularly effective on organic or biological applications. NF-10 ANTIFOAM Stable, water based silicone defoamer recommended for wastewater treatment applications where membrane filtration is not in use. MAF A liquid organic resin formulated for use as a chemical stabilizer when used with coagulants and flocculants. Allows for stronger floc to be formed that is much more sheer-resistant than polyacrylamides alone. When polymer sheering does occur, the flocculated particles are much more likely to bind together again. Especially effective in waters with high salinity and high chloride levels, where dissolved air or gas floatation is used as the sludge separation method. UF-437 Concentrated liquid formulation designed for use as a high pH cleaner of ultrafiltration (UF) and microfiltration (MF) membrane surfaces. Works to remove most stubborn biofilms and organic foulants. Can also be used to remove metal oxide deposits when used in a pH range of 9 – 10.5. Compatible with most MF/UF modules. Concentrated liquid formulation designed for use as a low pH cleaner of polyamide thin film composite membrane surfaces. Used for removal of scalants like inorganic carbonate, phosphate, and sulfate as well as metal oxides. Works in many applications where citric or hydrochloric acid do not. Woks with all thin film composite R.O. membranes from all major membrane suppliers. C-227 High strength powder formulation designed to remove heavy organic fouling from membrane surfaces. Disperses biological slime and inorganic particles like silt, silica and clay. Can remove polymers, emulsified oils, dyes and organic colors from membrane surfaces. Compatible with all thin film composite R.O. membranes from all major membrane suppliers. This photo shows the effect of adding CIFCB Ferric Chloride coagulant into a food processing wastewater. 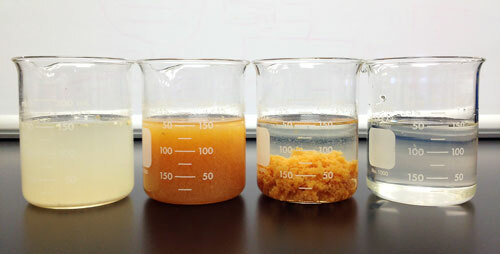 From left to right – raw wastwater, CIFCB coagulant, FL-neg polymer, and treated wastewater. TSS readings dropped from 750mg/L to <6mg/L.